Judge Approves $25 Million Settlement Of Trump University Lawsuit : The Two-Way The deal was reached in November but needed the approval of U.S. District Judge Gonzalo Curiel. One student had objected to the settlement, which prevented her from suing Trump on her own. 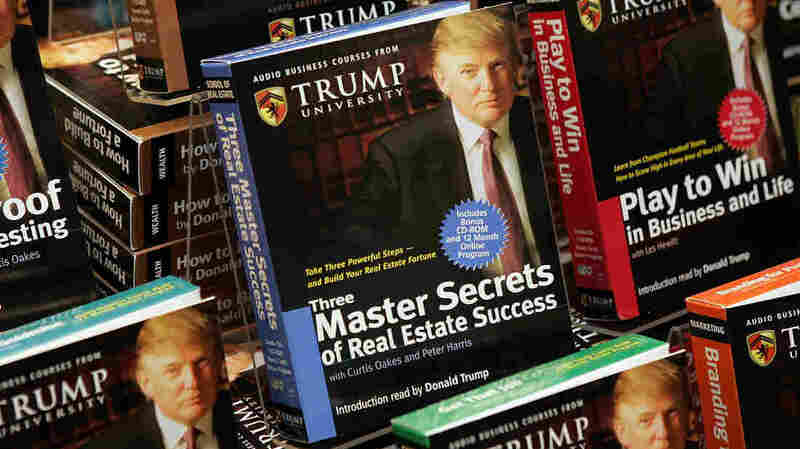 Copies of How To Build Wealth, a series of nine audio business courses created by Trump University, were on display at a Barnes & Noble store in New York City in 2005. A federal judge has approved a $25 million settlement deal between President Trump and students who paid for Trump University real estate seminars, bringing lengthy litigation to a close. The deal, which calls for Trump to reimburse the students who say they were defrauded, was struck in November but needed approval from U.S. District Judge Gonzalo Curiel. He signed off on the settlement Friday in San Diego. Trump doesn't admit any wrongdoing under the terms of the settlement. The settlement applies to three separate lawsuits — two class-actions and a fraud case. The $25 million deal includes payouts to more than 6,000 Trump U students who paid thousands of dollars for courses they describe as worthless. "The only holdup appeared to be a Florida woman's claim that she should be allowed to opt out of the settlement and sue the president on her own — a move that would likely scuttle the entire agreement. "Curiel said the high payments weighed in favor of approval and he noted that only two of about 7,000 eligible class-action members objected to the terms." You may recall that on the campaign trail, Trump accused Curiel of being biased because he is "Mexican." That claim was false — Curiel was born in Indiana — and even House Speaker Paul Ryan acknowledged that it was "sort of like the textbook definition of racism." Trump doubled down on the comments before saying he wouldn't talk about Curiel any more. Curiel had urged both sides to settle. And what about the fraud allegations that underpin these lawsuits? NPR's Ina Jaffe reported last year that students paid $1,500 to $35,000 for courses on "real estate investment secrets" ostensibly taught by instructors handpicked by Trump. "They claim that the promised Donald Trump investment techniques were mostly stuff that you could find on the Internet, some of which was illegal in some of the states where the seminars took place," she said. "They say that the promised mentoring was worthless or nonexistent, that the instructors were unqualified and that they were definitely not handpicked by Donald Trump, as he claimed. "And transcripts of Donald Trump's deposition ... confirm that he was relatively unengaged with what went on in Trump University." Trump's lawyers said the allegations are false. NPR's Jim Zarroli spoke with an unhappy Trump University customer who said he paid $35,000 for "secrets" such as the fact that he could go to the IRS website to learn about federal tax deductions. "The more and more I got involved in Trump University, the more and more I found out that I had truly been scammed," Bob Guillo, 76, told NPR. "At first it was embarrassing," Guillo said. "Then I became very, very angry that the man that scammed me out of all that money had the audacity to run for president. And I'm still angry."